SADDLE STITCHING (2 staples through the spine of a folded document) and SIDE STITCHING (staples through the side of a set of pages) are the most affordable method of binding. PLASTIC COMB BINDING is quick and most affordable and can be removed and replaced easily. It suits both small and large documents as it can handle up to 500 leaves! METAL WIRO BINDING is one step up in that it looks neater than the combs but it’s just as quick. Except for side stitching, all the above options allow your document to lie completely flat when open. 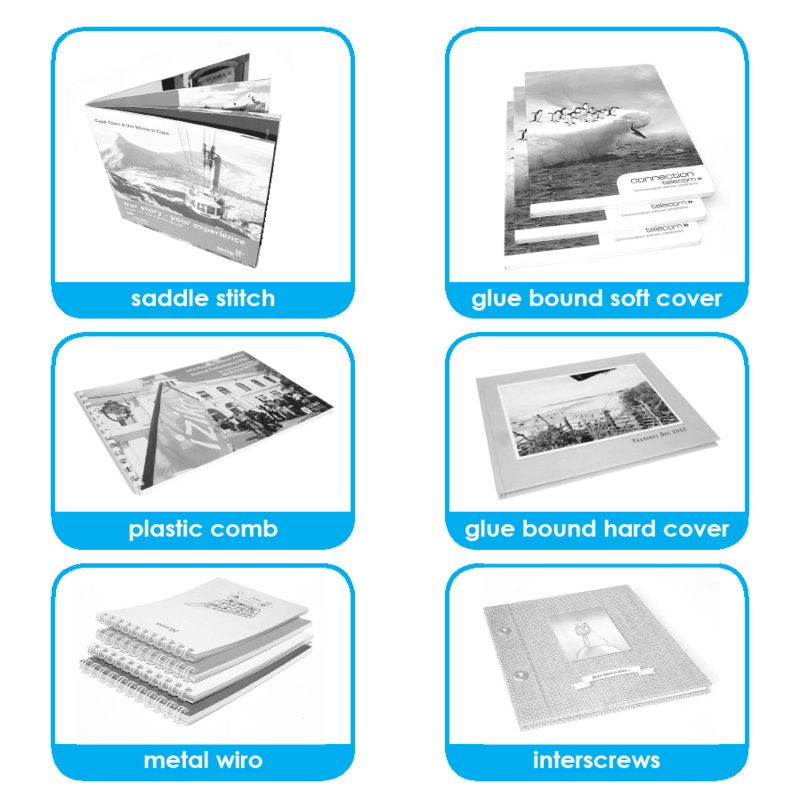 GLUE BOUND BOOKS WITH A SOFT WRAPAROUND COVER look very professional and work well for high quality presentations and books. These also allow you to brand the spine. GLUE BOUND BOOKS WITH A HARD CASE are definitely the most sophisticated solution. They make great photo books and convey a perception of best quality for high end presentation or portfolio documents. Although they do not lie completely flat when open, these beautiful books are very durable and the spines can be branded too. We also offer BINDING WITH INTERSCREWS. These work best with loose covers and are well suited to menus as one can easily edit and replace the contents. We can custom make hard covers to almost any size allowing complete flexibility. Here’s our spot where we’ll update you on what’s hot in the world of print and design, plus keep you updated on cool happenings and future possibilities.